Camera cards are continuing to grow in size at an astounding rate. 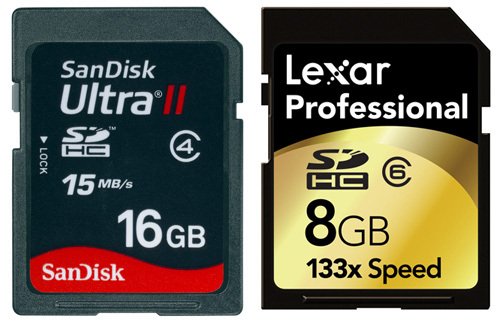 Today I can buy a 16GB SDHC card for the same price that I bought my first ever 1GB SD card. SanDisk ImageMate All-In-One USB 2.0 Reader/Writer – supports, SD, SDHC, miniSD, miniSDHC, microSD, microSDHC, MultiMediaCard, MMCplus, MMCmobile, RS-MMC, RS-MMC DV, Memory Stick, Memory Stick PRO, Memory Stick Duo, Memory Stick PRO Duo, Memory Stick PRO-HG Duo, xD, xD Type M, xD Type M+, xD Type H and CompactFlash cards. The specialist card readers were roughly 9-10% faster (50.3 seconds time saved) at transferring from this Lexar Professional 133x 8GB SDHC card full of 8 megapixel photos to the laptop hard disk compared to the laptops built-in SDHC reader. The specialist card readers were roughly 20% faster (4 minutes 36 seconds time saved) at transferring from this Sandisk 16GB Ultra II SDHC Card (Class 4 15mb/sec) full of 8 megapixel photos to the laptop hard disk compared to the laptops built-in SDHC reader. Specialist camera card readers can cut transfer times by appx 10-20% (4 minutes 36 seconds time saved for a 16Gb SDHC card). The Lexar reader was a tiny bit faster than the Sandisk reader but speed test results from both brands were almost the same (within the margin of error). The SanDisk ImageMate reader is a stylish addition to any photographer’s arsenal, and with a wide range of support for most card types, it’s good value too. It’s perhaps more suited to sitting on a desk rather than being lugged around with a stack of lenses and peripherals thanks to its somewhat delicate stand system.